This is a magnificent fishing experience. We have personally fished with this outfitter and can attest to the quality of not just the fishing experience but everything involved here is top notch all the way around. Everything from the food and accommodations right down to the outfitter provided rain gear is top of the line an spot on. Nothing here is overlooked. It’s the kind of relaxing trip that leaves you highly satisfied and wanting to come back for more! The Lodge accommodates 16 guests. There are six double rooms with double beds and four single rooms with queen beds. A roll away bed can be added to your room for an additional guest if needed. Each room has a private bath and daily maid service is provided. Look forward to enjoying delicious meals in our spacious dining room. Our outstanding Alaskan chefs prepare a wide variety of local cuisine for you to sample. We also have an upstairs lounge with satellite television and wireless internet. After a fantastic day of fishing you can download your photos and swap stories with other anglers while enjoying a cocktail in front of the fireplace. The staff at the Lodge will greet you at the local Airport upon your arrival. We will transport you to the lodge, check you in, purchase fishing licenses, listen to a quick orientation and then enjoy a wonderful dinner. For your convenience, the lodge provides a shuttle service to and from the boat harbor although you may choose to walk, as the boat harbor is just a short distance from the lodge. • At least 8 hours fishing per day, last day fish for ¾ day. • Gratuities to the staff and guides: typically 10 – 15% of the package price total. May through June is the “Trophy King” season. Thirty to ninety pound Kings feed in these waters. You will troll for Kings using down- riggers and herring bait but don’t be surprised if you land a big Halibut, Ling Cod, Black Bass or Grey Cod while trolling. We call this the Trophy King Season because people come to catch the 50 pound plus Kings that are chrome bright and caught in the salt water. July is one of the best months to catch a variety of fish; King Salmon, Halibut, Ling Cod, Gray Cod, Yellow Eye, Black Bass and Silver Salmon. Along with some of the best weather in July, you will also have stunning wildlife viewing opportunities. In August the Silver Salmon are running with an average weight of fifteen pounds. 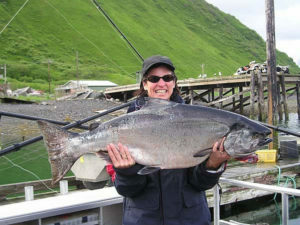 Some of the largest Silvers in Alaska are caught within 15 minutes of the lodge. The best method is trolling with the down riggers. After you catch your limit of salmon, get ready to catch some Halibut, Ling Cod, Gray Cod, Yellow Eye, and Black Bass! September is a great month to end the summer. Not only are the silvers hot in the salt water but the rivers have some great action with the fly or spin rod. Again, you always have the bottom fish to load up your fish boxes. The Outfitter utilizes four custom-built aluminum catamarans 25′ and 28′ long by 10′ wide. Each boat is five star Coast Guard rated, with full walk around cabins, fitted with twin engines, full marine heads, complete enclosed seating, complete electronics, top of -the line Loomis and Lamiglas graphite fishing rods, Shimano reels and all lures and bait. We have a few spinning outfits for the river fishermen, as well as a few fly fishing outfits available for use, but do not provide flies and generally recommend that you bring your own fly fishing gear. We fish 4 people per boat, with four individual downriggers and at least 100 square feet of fishing cockpit. We also have new jet boats for fishing our streams. Anglers will fish at least 8 hours per day, weather permitting and all of our captains are coast guard licensed. Gortex rainwear up to size 3X and 18″ knee boots up to size 14 are also provided at the lodge. You will troll for 30 to 90-pound King Salmon with down riggers and light tackle. The peak Trophy King Season runs from May 1st thorough July 15th, but they’re here all year long. Our guests have won the Kodiak King Derby three years running! Ten to 22 pound Silvers arrive in early July and are fished in much the same way we fish for Kings. The peak Silver Season is from mid-August into September. Load up your fish boxes with 5 Silvers per day per person! Add that to the rest of your catch and your home freezer will be FULL. 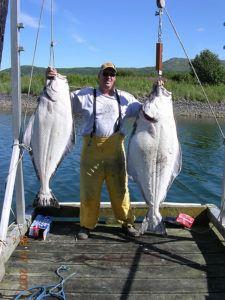 Halibut are available all year, although best from June 1st through mid-September. They are so plentiful that we often get them while trolling in 30 feet of water for King Salmon. 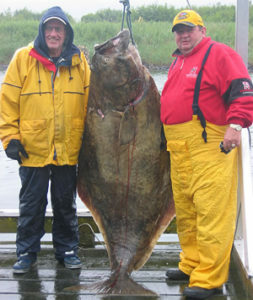 The Sitkalidak area has some of Alaska’s best Halibut fishing with all sizes available in shallow (30′ to 140′) waters with very light currents. No deep-water fishing in heavy currents, with pounds of weight to get to the bottom. The Outfitters area is abundant in bottom fish such as Snapper, Black Rockfish, Bass and the biggest Ling Cod you’ve ever seen. Old Harbor Lodge offers spectacular fishing for fly fishermen and spin anglers as well. Our fresh water creeks start receiving Dolly Varden in June, Pink Salmon in late July, Chum Salmon in mid-August and Silver Salmon in late August. Mid-August through the end of September will provide you with more action than you have ever imagined. Although the Kodiak deer hunting season opens August 1, we do not start hunting until November to mid December and both Doe and Bucks are open. The temperature begins to drop. The snow begins to fall in the higher elevations and the deer begin to move down to the lower elevation. Bucks are beginning to gather their does and go into rut. 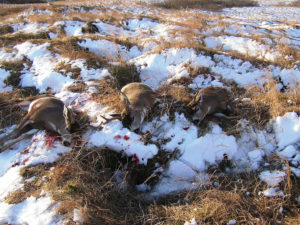 These combined conditions make this time of year ideal for black tail hunting. Due to the past three winter’s extremely mild temperatures, 2015 will prove to be an outstanding year to successfully harvest your Sitka Black Tail deer. There is very little Kodiak deer hunting pressure in Old Harbor. The area is very remote and the mild terrain will provide you with a challenging and rewarding hunt. The hunts are based out of the lodge. Each morning you will be transported to your hunting location for the days hunt. You will picked up at a pre designated location and returned to the lodge for a hot shower and a fantastic Alaskan meal where you can relax and share your Kodiak deer hunting stories. After you harvest your buck, you can add to your Alaskan experience by hunting fox, water fowl or fishing for winter King Salmon and halibut. The goal is to provide you with a first class hunt in remote Alaska that very few people have experienced. You will arrive at the Kodiak Sportsman’s Lodge the night before your hunt and depart in the morning after your last day of hunting. WE ARE YOUR ADVENTURE SPECIALISTS!